Although the new Vicks VapoRub ad featuring New Orleans Saints quarterback Drew Brees launched back on November 1, the media relations effort seemed to have hit its mark this past week given the blog posts and news articles I came across in my feeds. I hadn’t seen the ad before reading about them, but the coverage itself did make me pause. For starters, I’ve had a chest cold for nearly two weeks and the menthol in the cough drops just doesn’t seem to cut it anymore. Just from the standpoint of product benefits, a VapoRub does seem to be something that might help me sleep. Also, the coverage I saw–including this article in the New York Times–built a story out of the celebrity aspect of the ad. More specifically, the story revolved around how this Procter & Gamble brand was evolving to feature the man’s role in taking care of the sick child’s needs–a major change for a brand that, since it began advertising, had focused on the woman’s role instead. That made me pause not because of my current cold, but rather the ones I remember having as a child. Why? Because my experience with Vicks VapoRub was, more often than not, connected to my dad gooping me up with the salve, instead of my mom. That and a strong smell that invariably cleared out my nostrils and made it easier for me to breathe. Messy, but effective. A winning combination even though my dad is not a star quarterback like Drew Brees. Just a celebrity within our family! It is unconscionable to celebrate someone’s death. One can, in some cases, perhaps share a sense of relief. But celebrations are just wrong. My kids are still young enough that they perhaps have not picked up on the impact our War on Terror has on some individuals, specifically those who might find themselves targeted on account of their own targeting. But I’m not convinced they aren’t absorbing the news as it happens. Children’s minds have an amazing knack for learning. As an example, here’s a TEDTalk on the matter, courtesy of Alison Gopnik. This season’s pursuit of Muammar Gaddafi was only the latest chapter I’m filing away in my own memory about stories of the Mad Dog of the Middle East. The gruesome videos and stills of Gaddafi’s final moments will rest right alongside what I recall of all sorts of misdoings he helped spark, from Lockerbie to Rome. Because in the early-to-mid-1980s I absorbed some things which maybe I shouldn’t have for someone at my age: news of the day. Here’s the thing: I don’t think the media coverage from Libya last month was out of the ordinary. By showcasing the death of a man–however wrong the man may have been in life, and however wrong his assassins may have been in ending it–the news outlets and citizen journalists online only followed a pattern of macabre coverage established long ago. 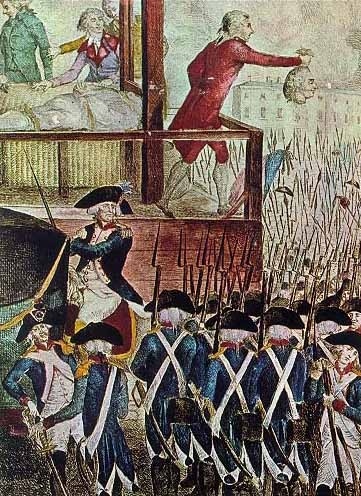 Witness: This painting of Robespierre’s beheading during the French Revolution. But if the coverage itself was not unique, today’s technology made it spread across the globe in real-time. Whereas the virility of news of Robespierre losing his life was hindered by the speed of horses’ hooves and ships’ sails, Gaddafi’s demise was known instantly. Even if the specific details weren’t. And the ubiquity of news outlets and channels we are able to tap makes it harder for us as people just to simply keep up and, as parents, to appropriately filter and protect.